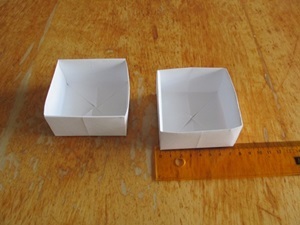 It is very easy and quick to make simple rectangular boxes out of paper without a pattern. When the temperatures in summer drop back into moderate areas, you will get into the mood to craft and make something. It might be to warm for wool or yarn, you can't even stand the warmth of the light of your sewing machine and think the engine warms the air. Baking gets beyond bearable in the end of July, beginning of August. This is the perfect time to grab paper and scissor and start with crafting Origami. 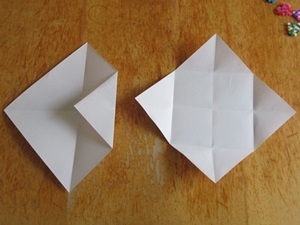 The folded paper boxes are quickly to make and can be folded by an age. If your kid is good at folding properly this can be a perfect craft for Kindergarten, pre-school and school ages. 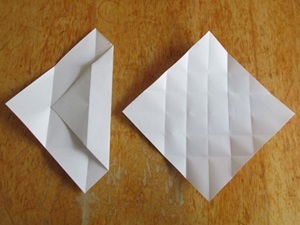 If you child does not like to fold very accurately, split the working load. You can do the folding and your sibling can cut and to the final steps – or your children might like to colour the paper before folding. 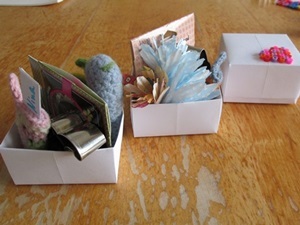 Depending on which size your box should be take or cut the matching paper. You will need a square. The edge length of the box will be a quarter of the diagonal of the square. If you use a Din A4 paper your boxes will be 7.5cm in length, if you start with a square of 28.5cm you box will have the edge length of 10.4cm and if your square is 12.4cm the little box will be 3.5cm in length. 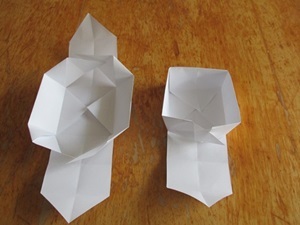 If you start folding the paper box for no other reason than crafting: try to experiment with sizes and paper: use wrapping paper, packing paper and transparent baking paper – we used this paper to make the small little box with matching lid. If you have such semi-transparent paper you might even guess what is in the box. 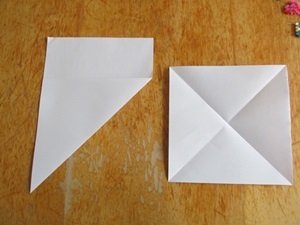 Step A: If your are starting with a Din A paper or any other rectangular-shaped paper, fold a square out of a rectangular- Therefore fold a corner of the shorter side to the longer side to have a triangular (see photo), cut the rectangular edge. 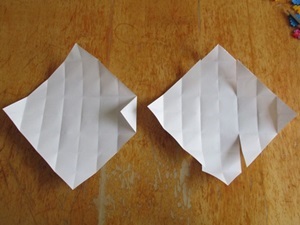 Step 1: fold each corner towards the opposite corner and fold the paper diagonally. Step 2: fold each corner to the centre. Step 3: fold each corner to the outer crease before the opposite corner. Step 4: fold each corner towards the first crease. Step 5: the last step before you start folding your box: four cuts towards the square bottom of the box - see photos. Step 6: take the long sides and fold the top edge into the centre and fold them to form one of the walls of the box. 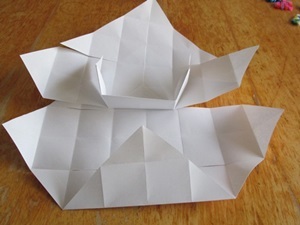 Step 7: take the short sides and fold them towards the centre, flap around the ends of the long sides. You have finished your box without any glue. If you prefer your box to be a little more solid, you can of course glue the sides and the bottom of the box. 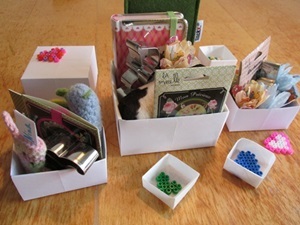 You can make a lid for your folded box – you can even use boxes of the same size – on the pictures you see the white boxes (started with DinA 4 paper) with hama bead heart (here you will find the pattern for the hama bead heart). These folded boxes are great as paper gift boxes, you can use them to make small gift baskets or start making boxes for an advent calendar. We used transparent baking paper for folding. Using baking paper you could box baked goodies like cookies or small cakes. Those who like a box in woolly texture: here you can find a pattern for a stable little crochet basket made of normal dk yarn.